Miami: - Visitors from around the world visit Miami because of its famous beaches and top class golf courses, and other sporting facilities. Miami is often very busy, so knowing where your points of interest are can help you save more than just your energy but time as well. 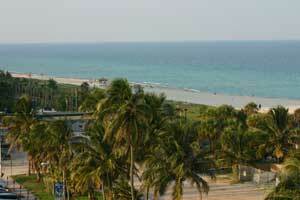 Miami South Beach is probably one of the most famous beaches in the world. You will see a diverse collection of cultures in person as well as the bars and restaurants that come from many parts of the world. Lincoln Road is a pedestrian mall between Alton Road and Washington Avenue. Basically it's Miami's version of New Yorks Fifth Avenue and you can find eateries galore as well as top name brand shops and stores. The Port of Miami is where most people who are taking carribean cruises will depart from. Known as the "Cruise Capital of the World" it has been the number one cruise passenger port in the world for over 2 decades. Accommodating some of the world's largest cruise ships and operations, it is currently the busiest in both passenger traffic and cruise lines.